Views of Orkney and Shetland communities are being sought as part of a study into potential cost reduction measures on the Northern Isles ferry services currently provided by NorthLink Ferries. The study will consider the potential impacts the proposed changes may have on businesses, organisations and individuals. It will be carried out by BM Consulting and Reference Economic Consultants who will shortly contact a range of ferry users and other interested parties for their views. This work will be overseen by a working group drawn from the Scottish Government, Orkney Islands Council, ZetTrans and NorthLink Ferries. It follows the commitment given by Ministers earlier this year to carry out further work to explore options to achieve savings on the services. "It is vital that the Orkney and Shetland communities are able to play their part in contributing to long term sustainable economic growth for Scotland. These lifeline services provide a vital transport link and it is important that we look at how we can continue to provide a cost effective and efficient service within the current challenging economic climate". The work will be carried out over the next few weeks and the working group will report back to Ministers in the autumn. People can also contribute their views by email to NIF consultation or by writing to: Scottish Government, Ferries Division, Victoria Quay, Edinburgh, EH6 6QQ. The deadline for making comments to the Scottish Government is Tuesday, 31st August 2010. Bridge strikes, frequently caused by lack of driver awareness of bridge heights, is costing the public purse around £0.5 million a year. Transport Minister Stewart Stevenson today highlighted the costs at the annual industry TruckFest show in Edinburgh as he launched a new driver information campaign to raise awareness of the risks to drivers of high vehicles approaching bridges. The Transport Scotland ‘Strike it Out’ campaign aims to raise awareness of the dangers of striking a bridge as well as highlight the cost to the public of repairs and delays. “Bridge strikes impact heavily on road users, both in terms of delays whilst an incident is being dealt with and later as repairs are carried out, often at substantial cost. “While it is fortunate that to date there have been no serious injuries or death as a result of a bridge hit, it is important that for a small investment we can raise awareness of these risks and help provide advice to prevent bridge strikes happening in future. The standard height for a bridge is 16 feet 6 inches (approx. 5 metres) however the majority of strikes occur on trunk road bridges above this height. In Scotland at least ten road bridges are hit each year, at a danger to both the vehicle driver and the public, and a significant cost - in the region of £500,000 each year for repairs alone. The most commonly hit road bridge is the Chartershall Bridge, crossing the M9, which has been struck 17 times causing it to now be closed, whilst the Challoch Rail Bridge (spanning the A75 at Dunragit) is the most frequently struck rail bridge in the UK, hit 18 times during 2009 and causing frequent closure of the A75. “FTA supports this initiative to raise awareness and provide routing information for vehicle operators. The consequences of bridge strikes for safety and network disruption are severe. We work with Network Rail and other authorities in this area and will be helping to distribute the leaflet produced by Transport Scotland as part of this campaign. Banff & Buchan MSP Stewart Stevenson attended an event in Banff Museum, High Street, Banff, this evening to mark the taking-over of the running of the museum by a local partnership. A partnership of local community, voluntary and heritage organisations has a two year contract from Aberdeenshire Council to operate the museum. The partnership has already extended opening hours; opened during the recent COAST Festival; will be opening during Banffshire History Festival (which is this Saturday); and have already exceeded last year's total visitor numbers. "This is a tremendous community effort pulling together many local groups and I commend all those who have made this project, even at this early stage, such a success. "There is an important place for local history collections such as those in Banff and it needs to be accessible to the townspeople as well as hopefully providing something of interest for visitors to the town." Banff & Buchan MSP Stewart Stevenson has welcomed the publication by Scottish Enterprise of Stage 2 of the National Renewables Infrastructure Plan (N-RIP). The first stage of the plan identified Peterhead as one of eleven key sites that would see the necessary infrastructure developed to encourage the development of manufacturing facilities for the offshore renewables industry. Today's report states that a combined public and private investment of £223 million would support the creation of 5,180 jobs and generating a significant economic boost to the locations identified. The report also recommends that the eleven sites are organised into three regional manufacturing clusters. "When Peterhead was identified as one of the key sites that would be developed for manufacturing offshore renewable equipment, it was a development that had the potential to substantially boost the economy of the town and the surrounding areas. "The publication of this new report represents important progress towards achieving that aim as it both identifies the investment that will be needed and outlines the scale of the rewards that are available. "Scotland has 25% of Europe's offshore wind and tidal energy potential and 10% of its offshore wave energy potential. The scale of the economic opportunities available is enormous, and Peterhead can be right at the cutting edge of these developments. "Today's report is real progress towards creating more skilled jobs in the area and boosting the local and national economy as a result." Banff & Buchan MSP Stewart Stevenson has welcomed the publication of the Scottish Government’s new five year strategies for supporting carers and young carers which will see £5 million invested in providing respite opportunities. For the first time, the Scottish Government has published a separate strategy for young carers, recognising the unique challenges they face. The strategy includes increasing investment on training for carers, giving greater priority to carers’ own health and establishing a Carers Rights Charter. “The immense contribution that carers make to the wellbeing of their loved ones is something that cannot be underestimated or applauded highly enough. It is often an extremely challenging and demanding task and as a society we owe it them to ensure that as much support for carers as possible is in place. “This new strategy will help shape that support for the next five years and I welcome its publication. The funding for respite care in particular is particularly welcome and will help to relieve some of the pressures carers face in their own lives. 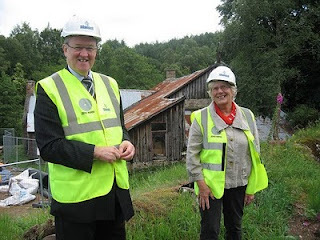 Climate Change Minister Stewart Stevenson is visiting Comrie tomorrow (Friday, 23 July) to see how a local community-led project is reducing village’s carbon footprint. Funding from the Scottish Government’s Climate Challenge Fund (CCF), is helping the Comrie Development Trust develop projects including a street-by-street insulation programme, community composting, food production, renewable energy production for community buildings and a local transport plan. The Minister will be shown around the nearby Cultybraggan Eco–Hub, the former army base which has been redeveloped, again using the support of the CCF. The site now includes green buildings for local workspace and manufacturing, allotments for local food production and scope for leisure and recreation opportunities. The Comrie Development Trust has received almost £476,000 for 2 groundbreaking projects from the Climate Challenge Fund. Earlier in the day, the Minister will be in Twechar to see the work of Green Energy Aware Twechar – which is similarly using funding from the CCF to bring a community together to reduce Carbon emissions. “Only by working together in communities across Scotland can we hope to achieve the world leading climate change targets we have set. “That is why the projects I am visiting today are so important. It shows people coming together where they live and taking innovative and concerted action to reduce carbon emissions. An historic woolmill, allotments and a community centre will be visited by Scotland’s Climate Change Minister tomorrow (Thursday, July 22). Stewart Stevenson will be in Moray to see how local people are playing their part in tackling climate change through initiatives backed by Scotland’s £27.4 million Climate Challenge Fund. His first visit is to the Knockando Woolmill at Aberlour. The mill has received £9,122 from the Climate Challenge Fund towards the use of wool insulation to reduce emissions and a further £96,000 from the Scottish Government-funded Community and Renewable Energy Scheme to install an efficient wood pellet heating system. The Minister then visits the Glamourhaugh Community Allotments to see how the Huntly Rotary Club project, supported by climate challenge funding of £9,820, is progressing. Mr Stevenson later travels to Findhorn Ecovillage to learn how £241,450 from the Climate Challenge Fund is being used by The Park Ecovillage Trust to develop a "hands on" sustainability education package for schools that will prepare students to take action to reduce their carbon footprints. He will inspect "eco-kits", including renewable energy generating photo-voltaic cells, small wind generators and solar-thermal panels which will be used in school learning projects to power a water purification system. "The Climate Challenge Fund (CCF) has captured the imagination of communities all over Scotland and demonstrated nation-wide commitment to reducing carbon footprint. “I am delighted to be visiting Moray to see for myself how local initiatives are empowering communities to play their part in tackling carbon emissions. The new Airdrie – Bathgate route will be a significant enabler towards a greener Scotland said Transport Minister, Stewart Stevenson today. The Minister was speaking during a visit to Bathgate to see some of the initiatives being implemented at the relocated station in advance of the new line opening in December. "Scotland has the toughest climate change legislation anywhere in the world and our climate change delivery plan means persuading motorists to get out of their cars and use more sustainable forms of transport. That's why we are investing £300 million in the Airdrie – Bathgate route to bring considerable benefits for the communities along the route, forming a direct rail link to Glasgow and Edinburgh for towns like Caldercruix, Blackridge and Armadale for the first time in 50 years. “Together with the Scottish Government’s £4 million cycling plan, the new cycle path being constructed as part of this project will help us achieve our 2020 target of 10 per cent of all journeys taken in Scotland be made by bike. The new Bathgate Station will include a ticket office, two platforms, a footbridge, lifts and stairs. With a new access footpath from the town centre and 400 car-parking spaces, the station will offer a real public transport alternative. Four trains per hour will stop in each direction with an approximate journey time of 25 minutes to Edinburgh and 45 minutes to Glasgow. The project is funded by the Scottish Government through Transport Scotland. 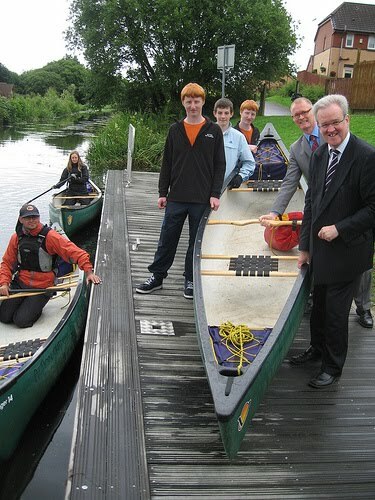 Mr Stewart Stevenson MSP, Minister for Transport, Infrastructure and Climate Change, visited the Action Outdoors Centre in Redding today to hear all about the innovative learning facilities’ green credentials. The Minister was met by representatives of some of the funding partners behind the Centre, which recently scooped top prize in the Education and Learning category of the British Urban Regeneration Association’s Waterways Renaissance Awards 2010: David Lamont, Head of Operations, British Waterways Scotland; Karen Moore, Development Director Scotland, The Waterways Trust Scotland; Sheila Maxwell, Community Regeneration Officer, Linkwide Housing Association, which specifically funded the Green Action Project; as well as Fiona Hamilton, Project Development Manager, Action Outdoors and Action Outdoors Volunteers, Adam Wond, David Walker, Nathan and Andrew Murphy. The Minister’s tour began with an introduction to the green energy pump which generates heat for the Action Outdoors Centre. The energy saving heat pump was funded by the Scottish Community & Householder Renewables Initiative (SCHRI) and the Waterways Trust’s Green Fund which was established with UK Boat Hire, Britain’s leading canal hire boat company to invest in low carbon technologies and other environmental projects which help mitigate for the carbon emissions caused by holidays taken along the canals and rivers. The pump works on the same principle as a fridge – cooling one part of the environment and thereby generating heat. In this case, using pipes submerged in the canal, a refrigerator plant cools the canal water and makes use of the heat recovered to provide hot water and central heating for the Action Outdoors building. Heat generated in this way has much reduced carbon emissions compared with conventional gas or oil boilers. The visit also afforded the Minister the opportunity of hearing more about the new Green Action Project which is based at the Action Outdoors Centre. Co-ordinated by Action Outdoors and The Waterways Trust Scotland, the Green Action Project is designed to give local 16-24 year olds from disadvantaged backgrounds greater employment opportunities and access to potential further education. Specifically, project participants are given the opportunity to enrol on a 12 week long environmental or tourism volunteer training programme, working through the environmental programme on the canal or at Action Outdoors or taking the tourism programme at The Falkirk Wheel. Green Action participants are also given the opportunity to participate in outdoor activities on the canal as part of a personal and social development programme. To date, 36 participants have successfully completed one of the training programmes and six young people have moved into employment or training as a result including one young person now employed full-time at The Falkirk Wheel. The Minister also met with some of Action Outdoors’ regular participants whilst they took part in canoeing and kayaking on the Union Canal, just outside the Centre. “The Action Outdoors Centre is making the best use of its immediate environment in an innovative and successful effort to reduce carbon emissions. "I am delighted to be in Falkirk to see how this centre is rising to the climate change challenge by harnessing the potential of our canals to contribute to a sustainable and active future - and ultimately helping Scotland to achieve its world leading emissions reduction targets." “We are delighted to welcome the Minister to Action Outdoors today. Since it opened in 2008, through the enthusiasm and efforts of funders, management and volunteers, the centre has gone from strength to strength and we are now seeing the real benefits to participants coming through as they develop a raft of new skills, both personal and those enhancing their employment potential. A midnight walk through ageing tunnels below the city of Glasgow might not be how most politicians would choose to spend their evening. However the Transport Minister did just that recently with a visit to Scotland’s only Subway network. Stewart Stevenson pulled on his hard hat and safety boots to witness first hand the labour intensive work carried out each night into the early hours that keeps the Victorian system running. “It’s terrific to visit a piece of Victorian engineering, to see it still serving a purpose in the 21st Century but also of course to see the challenges there are in maintaining something that was designed and built in another age. “Maintenance is a huge challenge, different parts of the network have different types of water, there’s limestone coming out of the render, hydrogen sulphite coming from old coal seams – all sorts of different challenges that have to be responded to by the very engaged and intelligent team of engineers who are working through the night to make the system continue to work during the day for so many people. Banff & Buchan SNP MSP Stewart Stevenson has announced details of his forthcoming surgery tour of local communities which commences next week. This year will be the tenth such tour that Mr Stevenson has undertaken, covering over 40 communities from Sandend in the far west to Cruden Bay at the south-western end of the constituency and inland to Auchnagatt, New Deer, Aberchirder and Inverkeithny. On day two of his surgery tour, Mr Stevenson will clock-up a milestone 650th surgery when he calls at Macduff. "The annual surgery tour with my mobile office is always extremely enjoyable and I think also that people appreciate having their MSP come to their own community rather than having to go to one of my 'static' surgeries in a nearby town or village. "Even in this age of electronic communications, people still value being able to have face-to-face contact with their elected representatives, which is important. It also gets me into some of our smaller communities which I may otherwise not have reason to visit during the course of a year." This tour will also be Mr Stevenson's final tour of some communities owing to boundary changes in the Scottish Parliament constituencies which take effect from May 2011. The Banff & Buchan Scottish Parliament constituency will disappear and be replaced by the new constituency of Banffshire & Buchan Coast. Meanwhile, communities in Central Buchan, along with Inverkeithny, Cruden Bay, Hatton and Longhaven will move into a new East Aberdeenshire constituency from next May. "I'll be very sad to lose these communities as I have very much enjoyed being their representative in Parliament. I will of course continue to be their MSP up until May 2011 when the boundaries change and will continue to serve them with surgeries. However, the tour with my mobile office is an annual summer event so this will, sadly, be the last time the tour takes me to Central Buchan, Cruden and Inverkeithny. "I'm looking forward to the challenges presented by the new Banffshire & Buchan Coast constituency which stretches from Boddam and Peterhead in the south all the way to Buckie in the west. The SNP's candidate selection process is underway and if I am fortunate to be selected by the local party members and then elected by the people I shall endeavour to do my best for the new constituency, as I hope I have done for Banff & Buchan during these last nine years." After an absence of nearly twenty years, direct trains will be carrying holidaymakers between Glasgow and Blackpool this summer. First TransPennine Express will run the new service at weekends through the peak summer season from 2 July until 5 September. Fares for the through journey to Blackpool will start at just £17 single. It is the first time since 1992 and the days of British Rail that trains have linked Glasgow directly with Blackpool making it that little bit easier for some of the ten million visitors attracted to the town each year. Full details of all train times and fares can be found on line at www.tpexpress.co.uk. Banff & Buchan MSP Stewart Stevenson has welcomed the publication of an updated Environmental Policy Statement by the Scottish Fishermen's Federation which underlines the industry's ongoing commitment to fishing in an environmentally responsible manner. "The publication of the first Scottish Fishermen's Federation's Environmental Statement in 2008 was a major landmark which demonstrated to the world the commitment that the industry in Scotland has to sustainable and environmentally responsible practices. "Nobody has more to gain from fishing being both profitable and sustainable than the Scottish fishing industry itself, and as well as showing a commitment to protecting the health of the stocks it relies on, the statement helped to re-affirm the first class reputation of the Scottish fleet to consumers. "This updated statement takes into account the changes and innovations that have taken place in the last two years and clearly demonstrates that the importance the fishing industry places on sustainability has not faded. It is an approach which I applaud and I believe that the industry in Scotland's determination to play an active role in conservation despite the difficult circumstances they face is something they should be truly proud of." Buses in Scotland will be helped to go green thanks to a new £3.4 million Scottish Green Bus Fund launched today. Bus Operators, local authorities and regional transport partnerships are being invited to apply for funding to help with the additional up front costs of buying low carbon buses. The scheme will provide a fresh incentive to operators to purchase eco-friendly vehicles for their fleet as well as help stimulate demand for green technology in Scotland. "Scotland has the toughest climate change legislation anywhere in the world and meeting these tough targets will require decisive action. Our climate change delivery plan makes clear we need to decarbonise almost all road transport by 2050 which is why we're helping our bus industry invest in the latest emissions reducing green technology. "This Government is taking action to reduce emissions from transport and this announcement follows the recent launch of a £4.3 million scheme to encourage the use of low carbon vehicles by Scotland's public services. "Scotland's role in the global effort to reduce emissions will create clear economic benefits and help maintain a thriving economy. We are leading the way in the development of low carbon transport technology and it's important we play to these strengths as we look to secure economic recovery and future sustainable economic growth. "The Scottish Green Bus Fund will make an important contribution to achieving our target of reducing emissions by 42% by 2020 and I'd encourage bus operators to use this opportunity to introduce green buses to their fleets." A multi-million pound project to provide grade separated junctions at Symington and Bogend Toll on the A77 has taken a significant step forward with the publication of made orders today. The scheme, which is located between Spittalhill Interchange and Dutch House roundabout, bring safety benefits to road users on the A77. The scheme will also deliver improved accessibility to and from this busy trunk road that connects central Scotland to Ayrshire and Dumfries and Galloway while providing vital access to the ports of Cairnryan and Stranraer. “Earlier this year the Scottish Government set out the actions being taken across the public sector to position Scotland’s economy for recovery and boost the long term performance of our economy. The A77 carries approximately 34,000 vehicles a day through this stretch and is not only a key link for Ayrshire communities but provides connections to and from Glasgow and further west via the M77. This scheme will improve safety along the route with the closure of central reserve gaps along a 4.5 mile (7.3km) section of the route. Grade separated junctions at Symington and Bogend Toll will provide for safer manoeuvres at these junctions. A scheme to widen the A77 carriageway between Parkend and Bennane has moved forward with the issue of tenders. The multi-million pound scheme will see construction of nearly two miles of widening works, allowing for dedicated overtaking opportunities in either direction. The scheme will enhance this vital route between the central belt and Stranraer and Cairnryan ferry ports by improving traffic flow, reducing journey times and ferry travel related convoys. 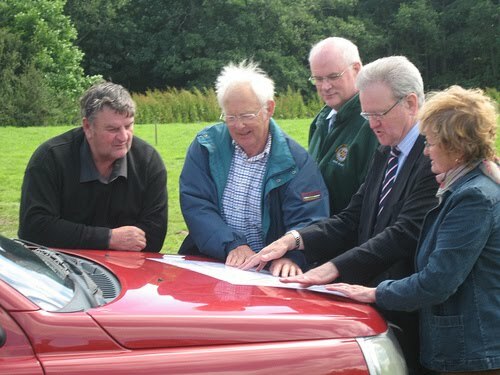 “I am pleased to see this important A77 scheme progressing quickly with the issue of the tenders. “This scheme is part of £60 million of planned investments along both the A77 and A75 and complements £29 million of investment already undertaken on these key tourist and business routes. The tender process is expected to be completed by autumn 2010 and it is anticipated work can start on site soon after for an expected opening in spring 2011. The 86 mile long A77 is a main link for south west communities and businesses, and this section of the route carries up to 3000 vehicles a day. A multi-million pound project to deliver an additional length of dual carriageway on the A9 at Crubenmore took a further step forward this week with the issuing of tenders. The project will see construction of almost two miles of dual carriageway (2.7km) providing improved overtaking opportunities on the A9 to the north of Crubenmore, reducing journey times and improving traffic flow on this key route connecting central Scotland to the Highlands. “This is an important step forward for dualling of the A9. These works complement improvements currently underway at Moy and Loaninghead, as well as a number of schemes already completed on this vital route. When completed, the scheme will support businesses, communities and tourism throughout Scotland by improving the access to and from Inverness and the Highlands. The tender process is expected to be completed by Autumn 2010 and it is anticipated work can start on site soon thereafter, with an expected completion in late 2011. Some advance works may be carried out later this year. Banff & Buchan MSP Stewart Stevenson will present the UNICEF Rights Respecting School award to the children of New Deer School on Friday 2 July (tomorrow) at 11.15am. Over the past session the school has worked towards an understanding and a better practice of Children's Rights according to the Charter of the United Nations Convention on the rights of the child. This has involved an examination of the school ethos with regard to this and also a wider study of Global Citizenship. New Deer School was assessed by a representative from UNICEF and awarded Level 1 in the scheme.